Happy halloween boys and ghouls! Shindig is throwing our retro music Halloween ball this year at Pet Sounds in Itaewon. 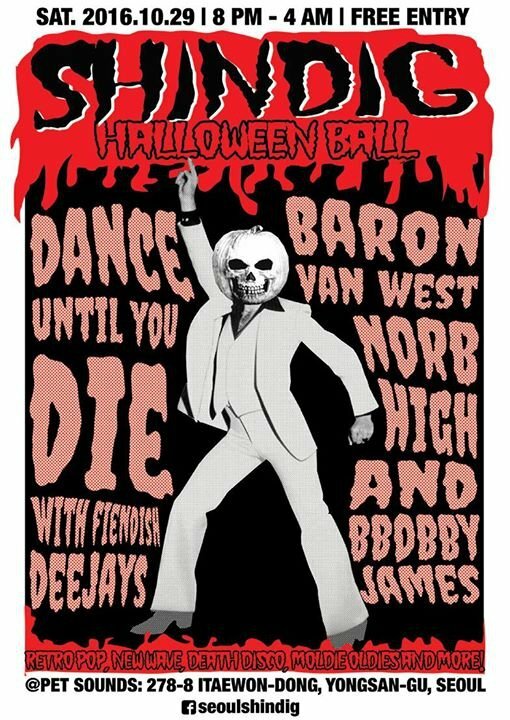 Rise out of your graves and dance to creepy beats provided by DJs Baron van West, Bbobby James, Norb and High. We'll be playing the best and the rest of retro pop, new wave, death disco, post punk, moldie oldies and much more! For you monsters who enjoy eye hole stimulation, there will be scary psychedelic visuals provided by the Baron. 1. Anybody who dresses up in a costume wiii get a FREE SHOT ! 2. FREE Halloween Cookie for the first 100 people !